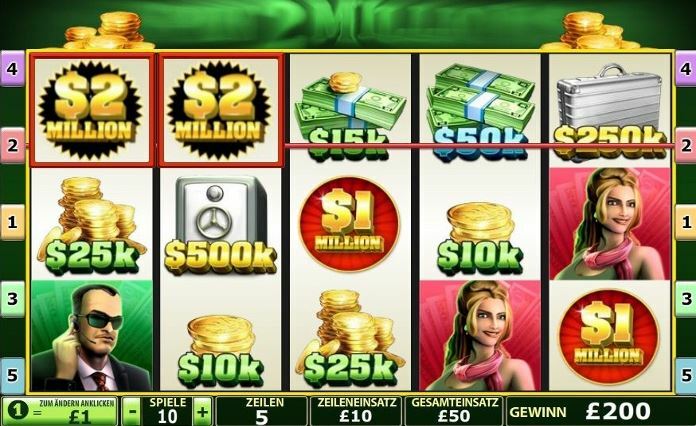 With the Playtech casino slot “Spin to Millions”, everything revolves around money. 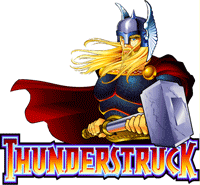 Try your luck and crack the safe in this exciting online casino game! 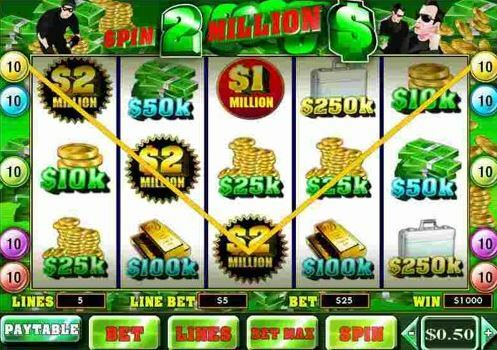 Click here to play Spin 2 Millions now, or continue reading, you will find all the details in this slot review! “Spin to Million” is set in a Ocean’s Eleven-type of world: there is money to be made (or stolen) everywhere, the huge safe is just waiting to be cracked by the robber. The symbols on the reels depict that: there is the leader of the operation, a beautiful woman and the safe cracker. All are accompanied by symbols of various amounts of money, including a 500k safe and a 250k suitcase. There are 5 reels in this slot. The crew that is trying to pull off this heist makes up the scatter symbols. The most valuable symbol is the “$2 million” logo. 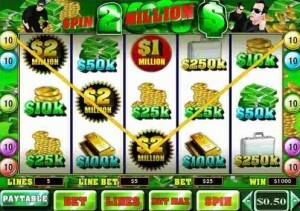 If you are lucky enough and the $2 million symbol appears 5 times in total, the payout will be 20,000 times your bet! 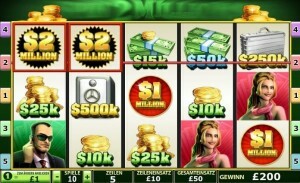 There are 5 paylines in “Spin to Millions”. You can choose between 1, 2, 3, 4 and 5 lines. 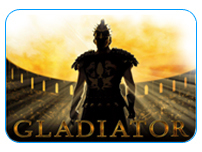 It is also possible to adjust the bet amount for each payline. All adjustments can be easily done at the bottom of the main screen. If three of the same scatter appear, a bonus round starts (the scatter symbols have to come up on consecutive reels). In the bonus round, you can pick one of three safes, which are then cracked by the robber. What’s in the safe, will be yours! 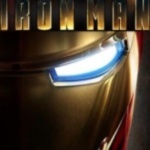 You can expect money prizes and free games! Furthermore, you can gamble your winnings if you feel lucky. You just need to select the “double up” feature after hitting a winning payline: if you predict the correct color of the next card (red or black), you will double your winnings. There is no progressive jackpot that comes along with “Spin to Millions”. All in all, “Spin to Millions” is a simple game that is perfect for beginners, as it doesn’t overwhelm you with complicated features or distracting graphics.